Fast, easy, brilliant results come easily with new HP LaserJet ColorSphere Toner. With HP's new generation of color toner, your HP Color LaserJet printing system produces a dynamic range of bright, brilliant colors. With more intense color and more subtle transitions between colors, you get bold graphics and realistic images. And with HP Smart Printing technology# that's finely tuned to the unique properties of HP's new toner, getting consistent, reliable results is easier than ever. 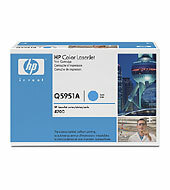 HP Color LaserJet print cartridges relay information to the printer to continually optimize print quality and reliability. In addition, information is shared between the supplies and the printer to assess supplies status and consolidate needed supplies into a single order. Just choose the reseller and order online.^ When you get brilliant print quality that's this hassle-free and easy, you're more productive and that makes HP printing supplies a real value.